In trying to find out what was going on at Whitechapel station because of Crossrail this weekend, I found this document entitled Crane and site related activity in Swanlea School on the Whitechapel Current Works page of the Crossrail web site. he document says this. We will position a small crane at the western end of Swanlea Schools grounds and use the crane to lift material over the school perimeter wall and in to the Crossrail Essex Wharf, Durward Street site. Delivery vehicles will access Swanlea School between 08:00 and 22:00 on Mondays to Sundays during this time. In addition to this, the Crossrail site boundary area will extend into Swanlea School grounds during the school holiday period. We will use the area to carry out preparatory work including the creation of wooden frames for future concrete pours and steel reinforcement pre-fabrication. 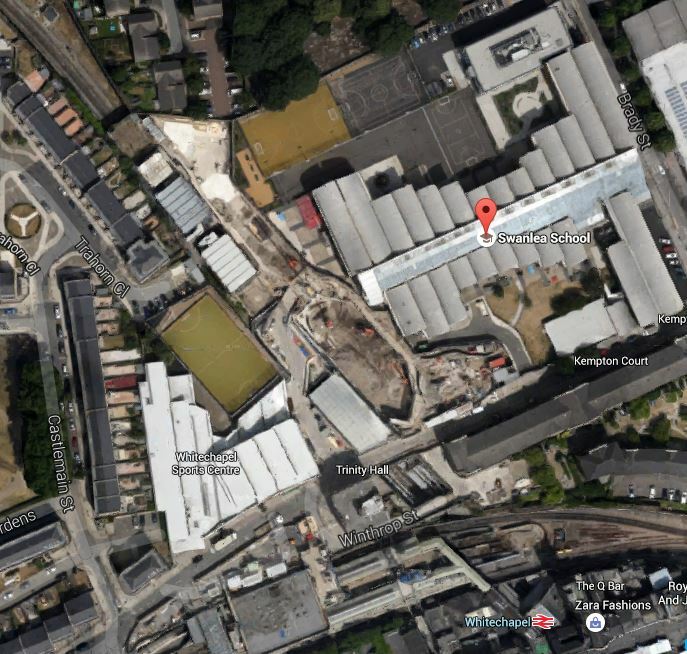 This Google Map image shows the relationship between Swanlea School and the Whitechapel station site. I would assume that Crossrail are paying an appropriate fee for the disruption to the school grounds. Whitechapel station is a very congested site in a busy area of East London and Crossrail seem to have used every trick in the book, to avoid unnecessary pain and disruption to residents, visitors and passengers. There are a lot of people worried about what will happen, if Crossrail 2 gets built through their area. They should take a trip to Whitechapel and have a look round to see how intricate heavy construction work should be done.